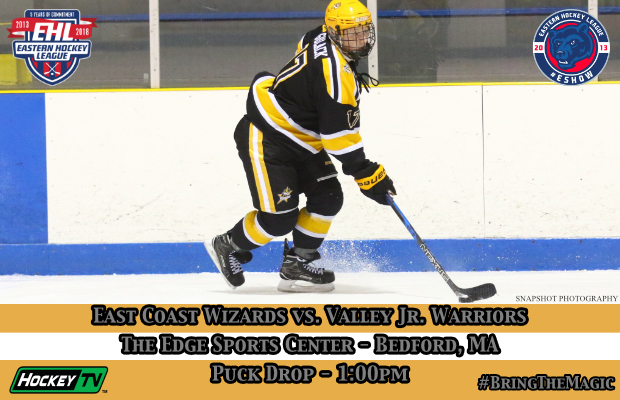 BEDFORD, MA -- The Wizards will look to bounce back this afternoon against the Valley Jr. Warriors at The Edge Sports Center. Today's matchup is the first time the Wizards and Warriors have faced-off since their first round series in last year's EHL Playoffs. The Wizards currently sit in 3rd place in the Boston Division with 28 points, 9 points behind the 2nd place Walpole Express. The Warriors are fresh off a 5-2 loss against the Express and currently sit in 3rd place in the New England Division with a record of 9-13-2. Going into today's game, the Warriors have a 2-4-0 record against Boston Division opponents in total so far this season.